Recently I was sent some loose eyeshadows from Silk Naturals so I wanted to do a makeup tutorial and a mini review on them. Silk Naturals offer a wide variety of mineral makeup. Their loose eyeshadows promise to be crease resistant and fade proof. They are very pigmented and give the best color payoff when applied wet. I like how they mention the exact shade and finish that they used for their eyeshadows in the description. Best of all they have swatches too! Which makes it so much easier to pick a color since I always end up looking for swatches for makeup products. They offer samples of all of their products so you can try out their selection at a small price. Here is the look I came up with! 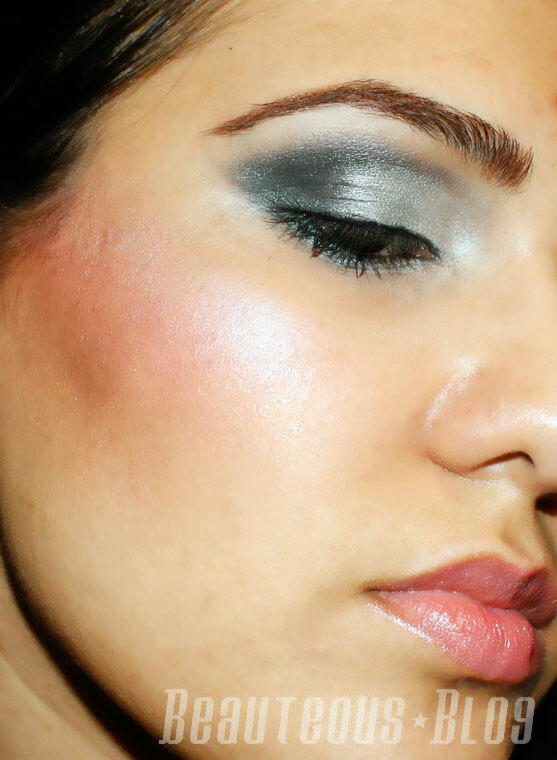 Its a very easy smokey eye, a look that I love doing since its just takes some blending to accomplish. If you want to learn how to create this look keep reading! Start off by applying your eyeshadow base. The first shade I used on my lid is Twister. Its described as a gorgeous satin pearl shade of teal. It's lovely- a really nice compliment to Lunar. Its a gorgeous shimmer finish light blue. I applied this with a damp flat shader brush. Note when you use eyeshadow wet to not use a soaking wet brush, it should be damp enough to make the eyeshadow in a paste. Apply this on the center of the lid making sure to press the shadow onto the lid. Next we are going to take the darkest shade, Kingfisher. Kingfisher has a navy base, with aqua green highlights, and aqua glimmers. Its sort of a duo chrome finish with blues and greens, its nothing like I have ever used before. It applies really smoothly and when used wet it still gives off a really nice glitter effect. Taking the same damp brush, apply this on the outer crease in a V shape. Blending it up into the crease. Make sure to pack on the color. I wanted to darken up the crease a bit more. Taking a matte black on a fluffy blending brush and blend Kingfisher into Twister. I used the Sigma blending brush with Rimmel's Jet Black. For the inner corner we are going to take Vapor. Its a creamy blue highlight Vapor looks like a shimmery cream color in the jar but when you apply it, it has the prettiest hint of blue highlights. It has a pearlescent slightly sheer finish with just a hint of sparkle. It applies really sheer so it makes the perfect highlight shade. Taking Vapor on a small blending brush, apply this in the inner corner and blending it down to the lashline. This is what you should have. I wanted the navy glitter of Kingfisher to come out a bit so I tapped on a bit of it on the outer corner with my finger. Next taking a matte cream shade, blend out the harsh edges. Now taking a makeup wipe, clean up the edges creating a sharp outer edge. Now just apply your favorite black eyeliner and mascara and you are done! Here is what I came up with for the rest of my face. I wanted to keep the lips a bit neutral with a soft pink shade. The blush is a rosy shade and I used Vapor as a highlight on my cheekbones. These shadows are a breeze to use. I didn't find any diffculity in applying them or getting a good color pay off. The pigmentation of these are really opaque. Vapor works really well as a cheekbone highlight since its a sheer highlight color. I didn't notice the blue undertone in Vapor which was mentioned in the product description. Since I always use a eyeshadow base I didn't notice it fading or creasing of any of these. The best way to use these is either with a cream shadow base or applied wet. So let me know what you think of the overall look and the products used from Silk Naturals! wow, you have done a great job with these shadows, very pretty Sid!! Lovely colors and review; amazing blending. Love the look you created. Ooh, I love those colors. Looks wonderful! aw thank you all for your lovely comments! whenever I want to do smokey look I always ended up with a big mess lol :( .. This is an excellent tutorial! I haven't come across that many bloggers who show step-by-step tutorials, and the ones I did come across, this is definitely the best one!